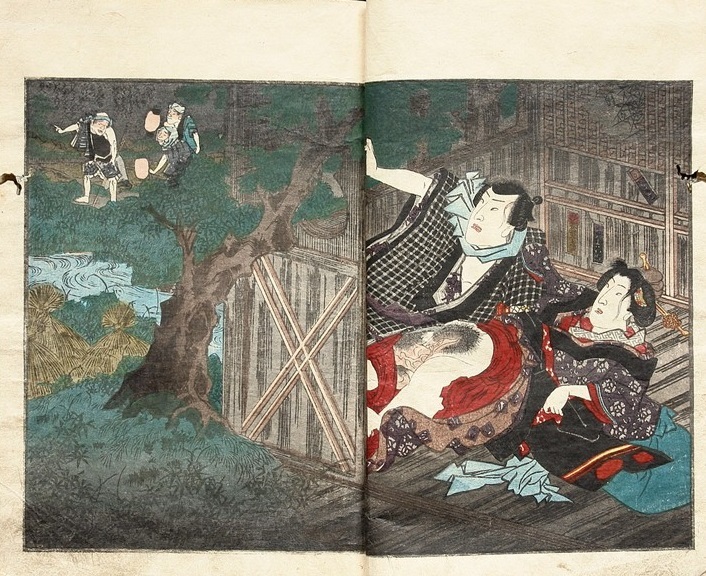 The following complete shunga book series called ‘Shunjo yosa no umi‘ was published circa 1850 and attributed to Utagawa Kunisada II (1823-1880). The designs in the books show us the intrigues of rich and poor clients as they entertain themselves with geisha of different positions and in varied locations. 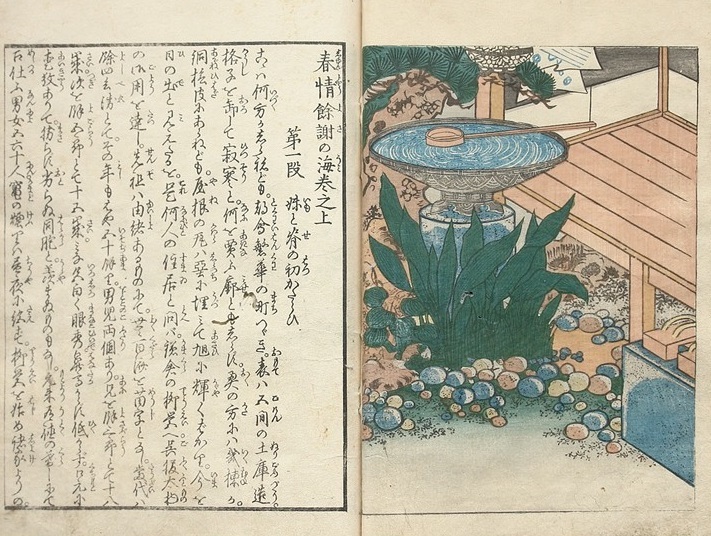 Composition with stone water basin and ladle near a verandah. In the right corner stand two Geta clogs on a stone platform.These kind of meditative scenes were included as a respite between the explicit scenes. An amusing image with activities in two separate spaces divided by the sliding door. On the left a female servant holding a rice cooker while being observed by a hungry street dog. Behind the opened sliding door of this dilapidated house we witness the intimate activities of two lovers. The female feels caught in the act by the sounds from outside..
Impulsive encounter in the hallway. They are completely merged. 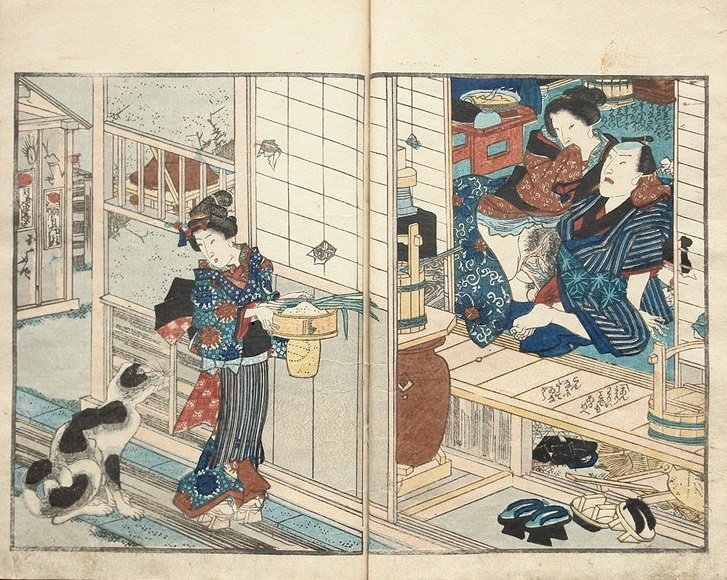 The couple on the right is spying on a geisha and her client in the other room. Male client wetting his fingers before penetrating a young inexperienced geisha. An experienced high-class courtesan (oiran) is eavesdropping on them while she tells a kamuro (geisha trainee) to keep it down. A wealthy client and an oiran smoke their tobacco pipe while making love. The large screen in the background features two daimyo lords sitting on a bridge surrounded by clouds. 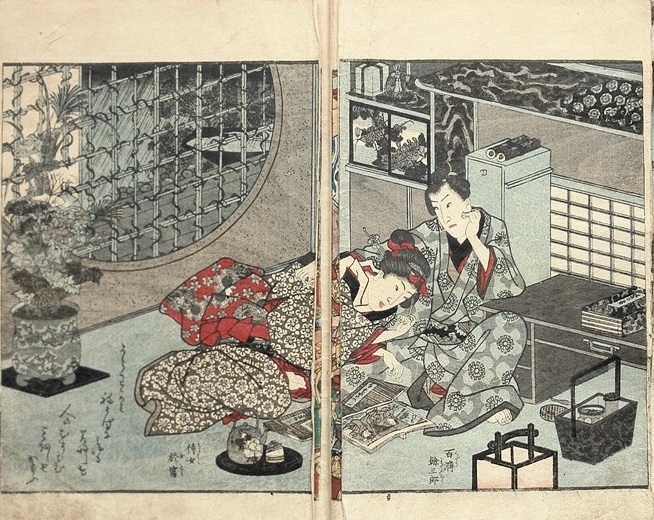 Two young lovers sneaked into a room where they examine shunga books. The girl clearly gets excited when she gets exposed to the pictures while her lover looks longingly at her body. 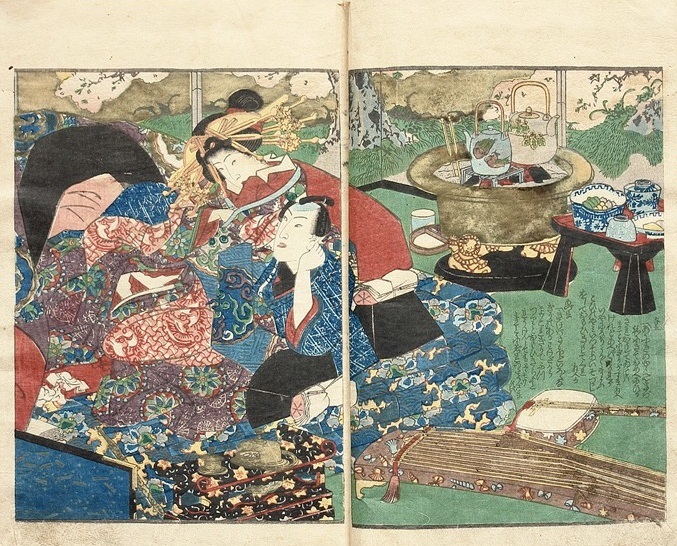 When the pages of the previous print are folded out it reveals this detailed overview scene of a performance of several geisha entertaining their clients. 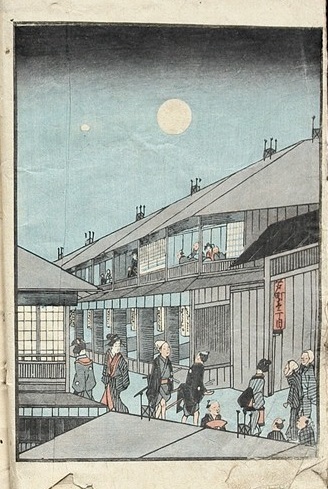 The Yoshiwara brothel quarter at night. 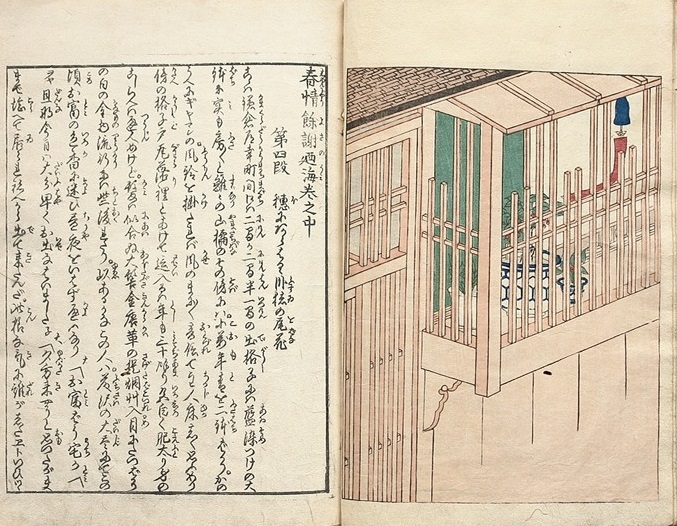 A tranquil scene of a small balcony. During a rainy evening a couple is getting ready for the act of love. Behind them in the garden stands a water reservoir with a ladle laying on it. A male client passionately makes love to a shy geisha. They are surrounded by plates of food, a shamisen (a tree-stringed instrument), tobacco supplies, tissues. On the cabinet depicting a stream, stands a bronze statue of a laying ox. On the top floor of a brothel, near a stairwell, a geisha and a customer make love. It must be a rich customer here, as can be seen in his beautifully decorated kimono that lies behind them. A more suggestive scene (only showing a part of the female leg) with an oiran and client having a relaxing moment. She just finished playing her musical instuments (shamisen and a koto in the foreground) while the two teapots stand on a hibachi (fire bowl) in the back, next to a small table displaying their food. 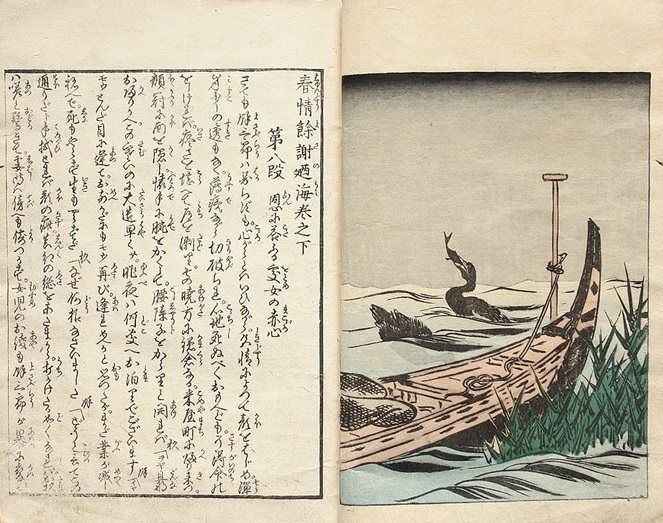 A rustic image of a moored fishing boat and two Japanese cormorants* catching fish. Two lovers have a secret intimate encounter between the rice straw (wara) near a rice field. An intimate couple has hidden in a derelict shed, while three men in the background are on their trail. Mysterious scene with a couple about to make love in a secluded barn. Dense clouds of smoke come from the pot that stands on the fire. Through the half-opened sliding door a small village is visible in the background. 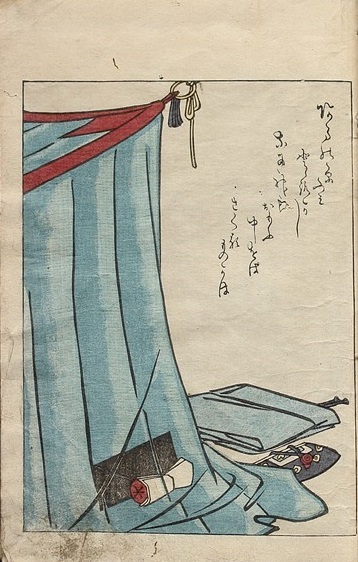 Evocative image portraying a mosquito-net and fallen geisha-pillow (taka-makura). 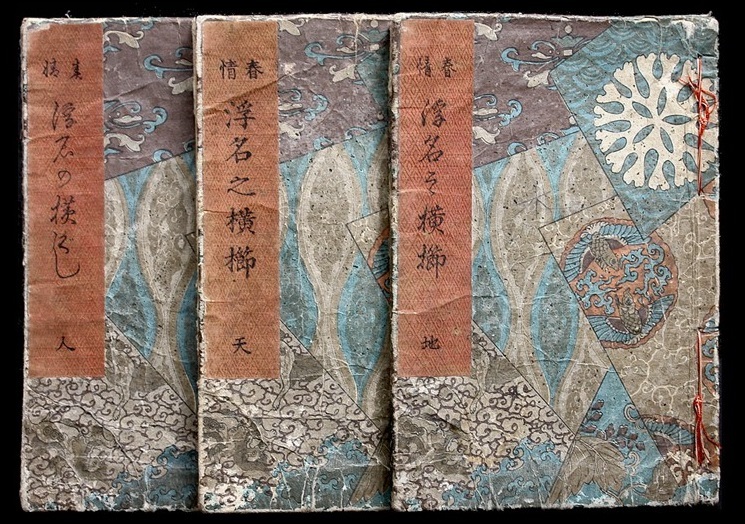 Click HERE for another complete shunga book set in this case designed by Utagawa Kuniyoshi…!!! The above set is available for sale (Sold). You can contact us here if you have any questions…!! *The cormorant fishing is a traditonal fishing method in which Japanese, Chinese and Korean fisherman trained cormorants to catch fish in the river. The heron could be a cormoran. Thanks a lot for your correction, Peter. I will change it!